Modification of teichoic acids with D-alanine by the products of the dlt operon protects Gram-positive bacteria against major antimicrobial host defense molecules such as defensins, cathelicidins, myeloperoxidase or phospholipase. The gra RS regulatory genes have recently been implicated in the control of D-alanylation in Staphylococcus aureus. To determine the impact of the GraRS regulatory system on resistance to antimicrobial host defense mechanisms and virulence of S. aureus, we compared inactivation of S. aureus SA113 wild type and its isogenic gra RS deletion mutant by the human cathelicidin LL-37 or human neutrophil granulocytes in vitro, and the ability to cause infection in vivo. We show here that gra RS deletion considerably alters bacterial surface charge, increases susceptibility to killing by human neutrophils or the defense peptide LL-37, and attenuates virulence of S. aureus in a mouse infection model. Our results indicate that S. aureus can regulate its surface properties in order to overcome innate host defenses. Staphylococcus aureus, a frequent cause of human infections, is highly resistant to antimicrobial factors of the innate immune system such as cationic antimicrobial peptides (CAMPs) [1, 2] which are produced by epithelial cells and neutrophils [3, 4]. These peptides generally contain 10–50 amino acids and have positive net charges . Due to their cationic properties, CAMPs can easily bind to the highly negatively charged bacterial cell envelope and inactivate bacteria, e.g. by forming pores in the bacterial membrane leading to bacterial lysis . S. aureus has evolved mechanisms to alter the anionic charge of cell surface components to gain resistance to a broad variety of cationic antimicrobial factors such as CAMPs , phospholipase A2 , myeloperoxidase , or lysozyme . One such mechanism is based upon modification of phospholipids in the cytoplasmic membrane by introducing a positively charged lysyl group into anionic phosphatidylglycerol by the MprF protein, thereby neutralizing the net charge of the membrane surface [11, 12]. A similar reaction is mediated by products of the dlt ABCD operon, which are responsible for attachment of positively charged D-alanine residues into negatively charged phosphate groups in the backbone of teichoic acids [7, 9]. Mechanisms involved in the regulation of these resistance factors are not yet well understood in Gram-positive bacteria. Herbert et al. recently found that the S. aureus two-component regulatory system gra RS positively regulates expression of the dlt operon. In a S. aureus SA113 gra RS deletion mutant, the content of D-alanine in teichoic acids was reduced by 47% and the mutant showed reduced resistance to various antibiotics including polymyxin B, gallidermin, and vancomycin [10, 13]. Accordingly, gra RS have previously been implicated in regulation of vancomycin intermediary resistance . As the dlt operon plays a key role in S. aureus resistance to cationic antimicrobial host molecules, the gra RS system may be important in evasion of host defense mechanisms such as cationic antimicrobial peptides and neutrophil killing. 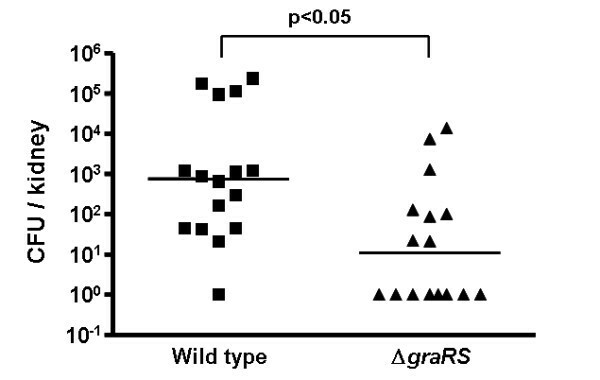 In order to study if reduced expression of the dlt operon upon gra RS disruption results in altered cell surface charge, we compared binding of the red-coloured, cationic protein cytochrome c to wild type S. aureus SA113 (WT), the isogenic gra RS mutant, and the plasmid-complemented mutant. The gra RS mutant bound significantly more cytochrome c than the WT or the complemented mutant (Fig. 1A), which is in accordance with the recently described reduced content of D-alanine residues in the teichoic acids of the mutant . Binding of cationic cytochrome c (cyt c) by S. aureus Sa113 wild type, gra RS mutant, and complemented gra RS mutant (A) and by the dlt A mutant and the dlt A/ gra RS double mutant (B). Bacteria were incubated with 500 μl cytochrome c solution (0.5 mg/ml) (A) or 750 μl cytochrome c solution (1 mg/ml) (B). The means and SEM of at least three independent experiments are shown. P values < 0.05 as calculated by Student's t test were regarded statistically significant. To analyse whether increased binding of cytochrome c by the gra RS mutant is in fact due to altered cell surface charge by decreased teichoic acid alanylation or the altered expression of other surface-exposed molecules, we also examined binding of cytochrome c to a dlt A deletion mutant, which completely lacks D-alanine substitution of teichoic acids , and a dlt A/gra RS double deletion mutant, which was generated by transducing the gra RS mutation into the dlt A mutant. Due to the high binding capacities of the dlt A and the dlt A/gra RS mutant we modified the conditions in order to prevent limitation of applied cytochrome c. Deletion of the gra RS genes in the dlt mutant background did not lead to further increased binding of cytochrome c compared to the dlt A mutant (Fig. 1B). This finding indicates that the increased binding of cytochrome c by the gra RS mutant is due to decreased alanylation of teichoic acids and that the resulting surface charge alteration does not result from other regulatory effects mediated by GraRS. Increased binding of cationic proteins may also result from reduced mpr F expression and, accordingly, reduced lysylphosphatidylglycerol (LPG) content. To control for this possibility, we compared patterns of membrane lipids from log-phase bacteria by thin-layer chromatography. 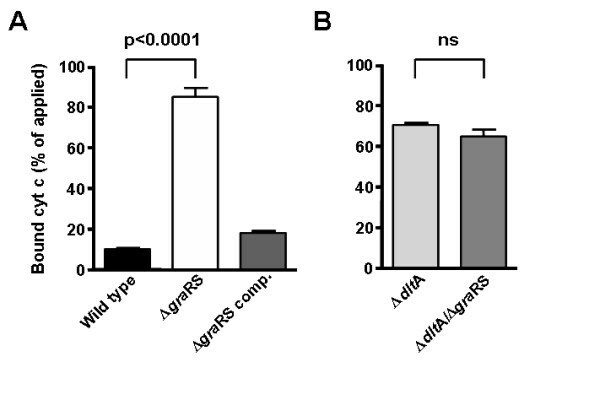 The amounts of LPG from WT and gra RS mutant were indistinguishable (data not shown), which corroborates recent findings that mpr F is not among the gra RS-regulated genes in S. aureus SA113 . In an attempt to test whether the increased affinity of the gra RS mutant to cationic molecules leads to higher susceptibility to human host defense peptides, we compared inactivation of WT and gra RS mutant by the human cathelicidin LL-37. This antimicrobial peptide is active against S. aureus at high concentrations or long exposure  but in this experiment we chose conditions under which the LL-37 did not affect viability of the S. aureus WT. Accordingly, the WT and complemented mutant strains showed no significant decrease in CFU following LL-37 exposure, whereas the number of gra RS mutant bacteria recovered was only 25% of the original inoculum (Fig. 2A). (A) Inactivation of wild type (black bar), gra RS mutant (white bar) and complemented mutant (grey bar) by LL-37 after 20-min incubation with 20 μg/ml LL-37. (B) Inactivation of wild-type (squares) and mutant bacteria (circles) by human neutrophils after 15, 30 and 60 minutes. The means and SEM of three independent experiments run in duplicate (A) and the means and SD of two independent experiments run in duplicate (B) are shown. P values < 0.05 as calculated by Student's t test were regarded statistically significant. Next we investigated whether the gra RS mutant is killed faster than the parental strain by human neutrophils, which produce high amounts of LL-37 and other CAMPs as components of their antibacterial killing arsenal. The gra RS mutant was killed by neutrophils considerably faster than the WT strain. After 15 and 30 min, the recovered CFU of the gra RS mutant were significantly lower than those of the WT (Fig 2B). Of note, our previous studies had shown that altered alanylation of teichoic acids does not affect the rate of PMN phagocytosis . Taken together, these data indicate that gra RS-mediated control of CAMP resistance mechanisms is of importance for S. aureus evasion from neutrophil killing. To investigate the impact of reduced resistance of the gra RS mutant to neutrophil and CAMP-mediated killing on the ability of the bacteria to cause infections in vivo, we compared the virulence of WT and mutant bacteria in a mouse challenge model. Therefore female BALB/c mice (12 to 15 weeks old) were infected with S. aureus WT or gra RS mutant bacteria. 72 h after infection numbers of CFU/kidney were determined. Significantly less bacteria were detected in the kidneys of animals, which had been infected with the gra RS mutant than those infected with the WT bacteria. (Fig. 3) This finding is in coincidence with the increased susceptibility to clearance by CAMPs and neutrophils, corroborating the central importance of these host factors in innate defense. CFU of wild-type and mutant bacteria in kidneys of mice 72 h after intraperitoneal infection with 1.2 × 10 8 bacteria. For each strain 16 animals were tested. Medians are given as horizontal lines. A P value < 0.05 as calculated by Student's t test was regarded statistically significant. A large variety of regulatory systems has been described in S. aureus during the last decades [16–18]. While many systems have been shown to control adhesion and toxin production , much less is known about the regulation of genes involved in the resistance to antimicrobial peptides, such as the dlt genes. However, the critical role of this operon in infection [7, 9] suggests that it may be appropriately regulated in response to environmental stimuli. Listeria monocytogenes expresses the VirR transcription factor, which regulates both the dlt operon and the mpr F gene . The S. aureus regulatory genes rot and arl have previously been shown to have a moderate influence on transcription of the dlt operon [21, 22]. We have recently demonstrated that inactivation of the GraRS system leads to only 13% of the wild-type transcription level of the dlt operon and a decreased level of teichoic acid alanylation in S. aureus SA113 . Other important genes regulated by gra RS in S. aureus include the vra FG genes involved in the resistance to vancomycin [10, 13]. Similar data have recently been presented for the Staphylococcus epidermidis aps system . This three component regulatory system is homologous to the gra RS system of S. aureus. However, when initially describing the gra RS system in S. aureus, Meehl et al. failed to recognize the three-component nature of this system . Li et al. recently showed that deletion of gra S in the community-associated MRSA strain MW2 leads to decreased minimal inhibitory concentrations of some cationic antimicrobial peptides such as the human beta-defensin hBD3 or the human cathelicidin LL-37 and, similar to our studies, to decreased virulence of the mutant in a mouse infection model . Furthermore, they could show that several important factors in CAMP resistance including the dlt operon and mpr F are activated by a diverse panel of antimicrobial peptides . The fact that mpr F is not regulated by gra RS in S. aureus SA113 could be due to the deficiency of this strain in the global gene regulatory system agr  or to other genetic defects. We could show here that, besides its role in influencing the effectiveness of pharmacologic antimicrobials, the GraRS regulatory system plays a key role in resistance to natural antimicrobials of our innate immune system against S. aureus and merits further attention in an era of increasing reports of virulent and drug-resistant strains of this foremost human pathogen. Staphylococcus aureus SA113 (WT), the isogenic gra RS deletion mutant , the plasmid-complemented gra RS deletion mutant , the isogenic dlt A deletion mutant  and the isogenic dlt A/gra RS double deletion mutant were inoculated in basic medium (BM; 1% tryptone, 0.5% yeast extract, 0.5% NaCl, 0.1% glucose, 0.1% K2HPO4) with aliquots of overnight cultures and incubated at 37°C until logarithmic phase was reached. In case of the complemented mutant, BM was modified by replacing glucose with 0.5% xylose to allow for expression of the plasmid-encoded gra RS genes . The gra RS::erm/dlt A::spc double mutant was created by bacteriophage φ 11-mediated transduction of the gra RS::erm mutation into the dlt A::spc deletion mutant. To prepare bacteria for the mouse infection model, precultures of the staphylococcal strains which were grown for 8 h in tryptic soy broth (TSB) were diluted 1:100 into fresh TSB and incubated for 18 h without shaking. Log-phase bacteria were harvested, washed twice with potassium phosphate buffer containing 0.01% human serum albumin (KPi buffer) and bacterial density was adjusted to an OD600 of 3. Bacteria from 1.5 ml aliquots were resuspended in 500 μl cytochrome c (Sigma) solution (0.5 mg/ml) in case of the wild type, the gra RS mutant and the complemented gra RS mutant and 750 μl cytochrome c (Sigma) solution (1 mg/ml) in case of the dlt A and the dlt A/gra RS double mutant, respectively, and incubated at 37°C. In order to prevent bacterial sedimentation, samples were vigorously shaken. After 15 min, samples were centrifuged and the supernatant was assayed photometrically at 410 nm. Comparison of membrane lipid patterns by extraction of polar lipids and subsequent thin-layer chromatography was performed as recently described . Log-phase bacteria were harvested, washed twice with potassium phosphate buffer containing 0.01% human serum albumin (KPi buffer) and bacterial density was adjusted to an OD600 of 1.5. Samples (40 μl) with a final concentration of 20 μg/ml LL-37 were shaken at 37°C. After 20 min, 160 μl ice-cold KPi buffer was added to block further antimicrobial action and appropriate aliquots were plated on BM agar plates. After 24 h incubation at 37°C, CFU were enumerated. Bacteria were grown to logarithmic phase, washed, and adjusted in KPi buffer as described above. Neutrophils were isolated from peripheral blood of healthy volunteers by ficoll/histopaque gradient centrifugation as described previously  and resuspended in HBSS-HSA (HBSS containing 0.05% human serum albumin). Bacterial and neutrophil suspensions were mixed to final concentrations of 5 × 106/ml bacteria and 2.5 × 106/ml neutrophils. Bacteria were opsonized by addition of pooled human serum (Sigma) to a final concentration of 10%. Samples (500 μl) were shaken at 37°C. After 15, 30 and 60 min, aliquots were diluted in ice-cold water and vortexed vigorously to disrupt the neutrophils and halt bacterial killing. Appropriate dilutions were plated on BM agar plates and incubated at 37°C for 24 h for enumeration of CFU. All procedures involving animals were approved by the UCSD Animal Care Committee, which serves to ensure that all federal guidelines concerning animal experimentation are met. Female BALB/c mice (12 to 15 weeks old) were infected intraperitoneally with S. aureus WT or the gra RS mutant. Briefly, precultures of the staphylococcal strains which were grown for 8 h in tryptic soy broth (TSB) were diluted 1:100 into fresh TSB, incubated for 18 h without shaking, washed twice in PBS, adjusted to 3 × 108 CFU/ml in PBS and 400 μl of these suspensions were injected intraperitoneally. 72 h after infection, mice were sacrificed, one kidney was aseptically removed, weighed, homogenized, and serially diluted in PBS for plating on Todd Hewitt agar plates. After 24 h incubation at 37°C, the numbers of CFU/kidney were determined. We thank Gabriele Hornig for excellent technical assistance, Hubert Kalbacher for LL-37 and Nadine Göhring for critically reading the manuscript. Our research is supported by grants from the German Research Foundation (TR34, FOR449, GRK685, SFB766), the European Union (LSHM-CT-2004-512093), the German Ministry of Education and Research (NGFN2), the IZKF program of the Medical Faculty, University of Tübingen, to AP. DK did all experiments except for the mouse infection model, which was done by SAK and AK. AP supervised research and wrote the paper. SH generated the gra RS/dlt A double mutant. AP, FG and VN conceived the study and analyzed results. All authors read and approved the final manuscript.